September simply flew by faster than I ever could have imagined! There were a lot of things happening in real life this month, as you'll see below, and I simply allowed myself to get caught up in the flow. Also, can we talk about how the weather didn't seem to transition at all this year? One day, it was still summer hot and the next, it was already cooler autumn weather. I'm not complaining (too much). I honestly can't complain about the amount of amazing stuff that I got to do this month, because it's seriously blowing my mind that I get to have so much fun in my adult life. While there were a few things that definitely were not fun (Macky got sick, and my body is taking a while to adjust to cooler temperatures), majority of September was really great. 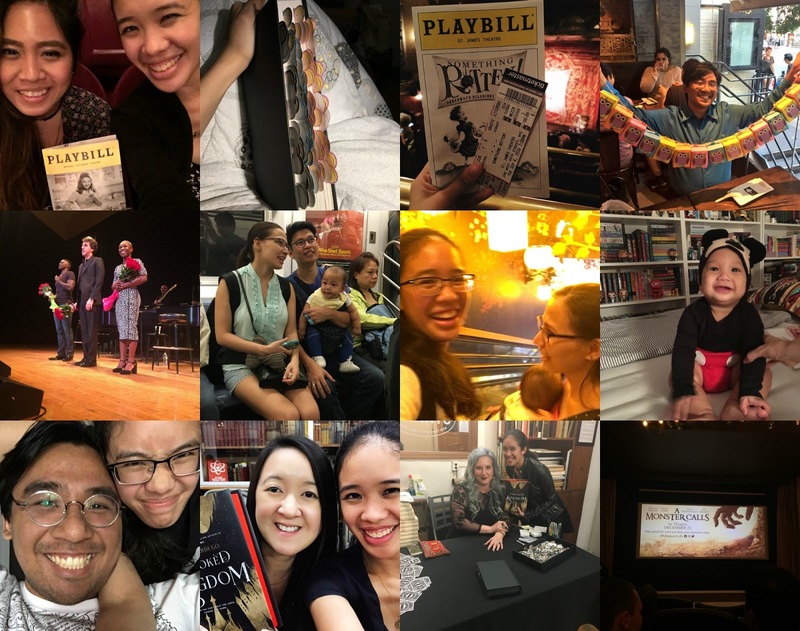 I got to see not one, not two but three musical performances (Waitress, Something Rotten + a special one night only performance of The Last Five Years). Macky and I celebrated three years of being married. We had friends come to town and stay with us for four days (along with their baby boy, who is so adorable). Macky got to attend an early screening of Miss Peregrine's Home for Peculiar Children (out this weekend, so go and catch it if you can) and I got to attend an early screening of A Monster Calls. And to close out this month's activities, I'm seeing James Bay with my best friend Danica tonight! All in all, it's been crazy but awesome - and October is definitely going to be even more full of fun stuff. Hello fellow fantasy readers! How are you getting along with reading fantasy novels to reach your Flights of Fantasy goals? I have the utmost faith in your ability to get it done before the end of the year! Anyway, out of curiosity, I'd love to hear your thoughts on this challenge so far. Do you like the loose structure or would you prefer tiers? Do you have any suggestions for how to improve or what additional things you'd like to see? Do you like the book club idea? Please let me know in the comments! Ahem, anyway, on to the fantasy reads. I managed to read eight fantasy books this month, five that were new to me and one that was a reread. I reread Six of Crows (which was still bloody fantastic), and read The Fate of the Tearling, Empire of Storms, The Graces, Like a River Glorious, A Darkly Beating Heart, Troubled Waters and Crooked Kingdom. 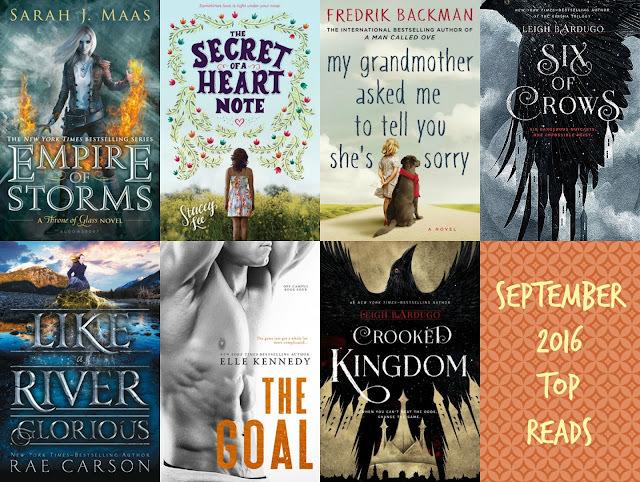 What was your favorite fantasy read this month?